A 20% potassium hydroxide (KOH) preparation in dimethyl sulfoxide (DMSO) is a useful screening test to rule out the presence of fungi. Before obtaining a specimen, the nails must be clipped and cleansed with an alcohol swab to remove bacteria and debris. The preparation does not require heating or prolonged incubation if DMSO is a component of the KOH solution. In proximal subungual onychomycosis, the overlying nail plate must initially be pared with a No. 15 blade. Then, a sample of the ventral nail plate may be taken. A No. 15 blade may also be used to remove a specimen from the nail surface in white superficial onychomycosis. Cultures should be obtained from pulverized nail scrapings or clippings while the patient has abstained from antifungal medication for at least 2 weeks. The specimen should be kept at room temperature with the cap placed loosely over the inoculated medium. Histologic examination of the nail is a very useful alternative to culture or KOH testing. Nail clippings may be sent to the laboratory for diagnosis in a formalin-filled container, or, as a last resort, an incisional nail biopsy (by punch or scalpel) may be performed to help confirm the diagnosis. Staining in the laboratory should be performed with periodic acid-Schiff stain (PAS) or methenamine silver stain to reveal fungal elements. 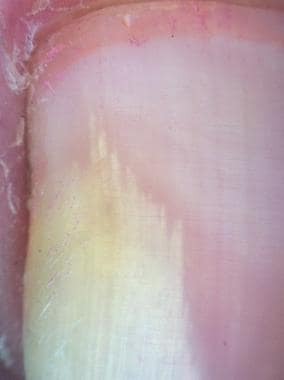 A comparison of diagnostic methods revealed that a nail biopsy and staining with PAS is the most sensitive technique available to diagnose onychomycosis. Examining formalin-fixed, PAS-stained specimens has a higher probability (a higher negative predictive value) than KOH examination in determining that a patient is disease free if the test results are negative. In addition to excluding other conditions (eg, psoriasis, lichen planus), the topographic distribution, the density, and the nature of the fungal elements may help guide treatment. Biopsy specimens of onychomycosis may show features of psoriasiform hyperplasia, including parakeratosis, thinned rete ridges, narrow suprapapillary plates, and dilated tortuous capillaries. As in direct microscopy, histopathologic diagnosis does not identify the species of causative pathogen.